7041 was constructed at Bristol Commercial Vehicles during 1976 and driven in chassis form, in common with the other ECW bodied Bristol VRs in our collection, to Lowestoft in Suffolk where she received an Eastern Coach Works 74 seat body, pretty standard to the National Bus Company at the time apart from (like 5137) being to the rarer 'highbridge' build at fourteen feet six inches tall. During September 1976 she was delivered to the East Kent Road Car Company Limited where she was accepted for service. She entered service at Folkestone where she was destined to spend her entire service life. During this period she worked the Hastings services across 'The Marsh' and the Folkestone to Canterbury services. 7041 was the first of six identical vehicles MFN41-46R and were East Kent's first Bristol VRs. MFN41R is the only member of this pioneer batch to survive and that was only due to her being selected to be turned into the 'Thanet Crimebuster' in September 1994. In November that year she was officially launched. By chance Jake saved the article in the local 'Adscene' newspaper and used it as a bookmark! 7041 was externally painted in a blue and white livery with security displays downstairs and a hospitality suite upstairs taking the place of the 74 NBC standard orange plastic seats. In this guise she visited High Streets, schools and local events. She was renumbered 9041 for this role. When Jake purchased 7681 (SKL681X) when he was working for Stagecoach, the two buses were parked side by side at Thanet garage. When 7681's engine and gearbox were installed, a few minor wires and pipes needed to be connected and Jake worked on 7681 using 7041 engine as a guide to fittings and fixtures. In 2003 she was renumbered 15741 in the Stagecoach series even though by now she was fully owned by Kent Police. This was because Stagecoach were still maintaining the vehicle on behalf of the police. 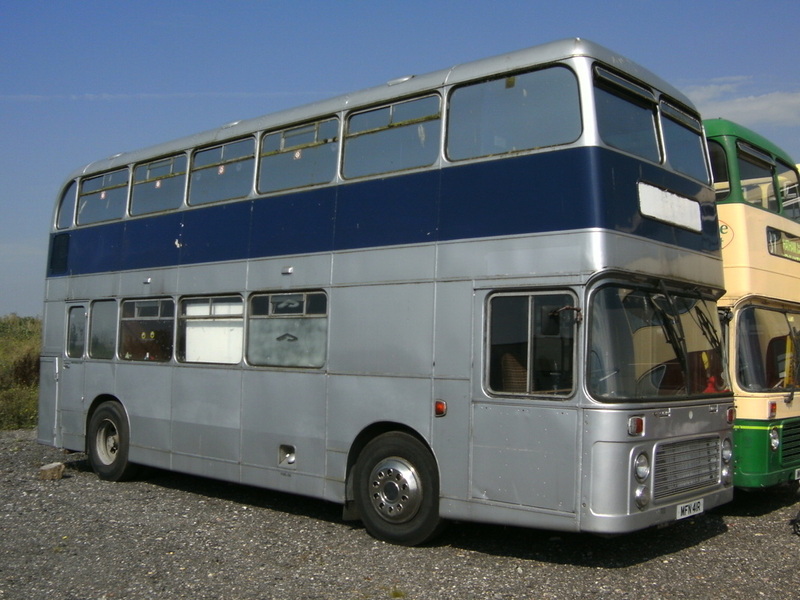 That same year the interior was given a refit and in 2006 she was repainted in the attractive silver and blue livery she wears today, very similar to the 'Jubilee buses' of the late 1970's when the Queen celebrated her silver jubilee in 1977. 7041 passed into Jake's ownership in 2011 and was immediately placed into store pending a decision on her future. Mechanically she is fit apart from a ball joint in the steering system needs replacing and her power steering fluid drains away. As with 5807, her internal conversion is to a very high standard and Stagecoach have looked after her well. However, unlike 5807, the conversion has robbed her of many original fixtures and fittings. Her interior is covered in soft trim and she has domestic lighting cut in to ceilings on both decks. The soft trim will have to be removed in most places - anyone knowing how Bristol VRs leak will understand how manky it's starting to go! A plan is in place to replace the ball joint and give her a service. Jake is hoping to get her MOT'd withing the next few years and she will probably remain in her 'Crimebuster' guise for the time being.